Know the marks. Make 811 work. Different marks say different things. You might already know that you should dig only by hand or with a spotter when mechanized equipment is used within 24 inches of a buried utility. But where does that 24-inch measurement begin? Knowing the answer prevents injury, saves money and avoids downtime. Watch this video now to start understanding the marks. Having issues getting timely and accurate utility marks? Tell us about it by completing an alleged noncompliance report by clicking here. 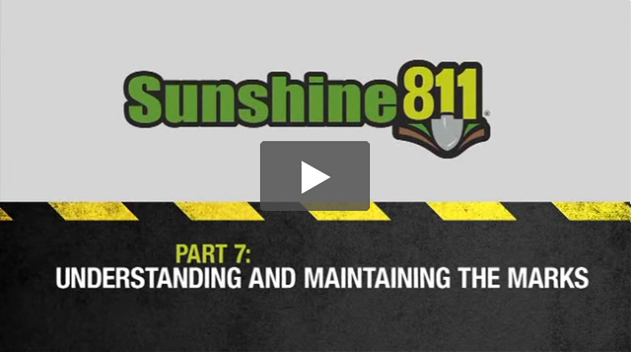 Watch the complete series of Sunshine 811 instructional videos. Dig site information in the palm of your hand. The new Sunshine 811 app! The new Sunshine 811 app makes it easy to keep track of member responses with a simple tap on Positive Response. With real time updates, you're always comparing the most recent responses to what you see at your dig site, keeping you and your crew safer and in the know.